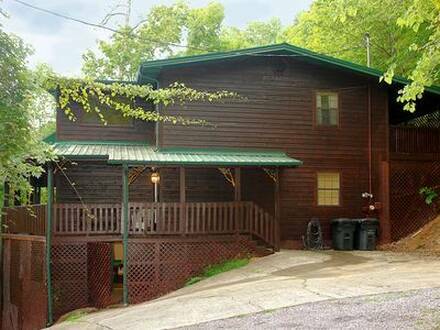 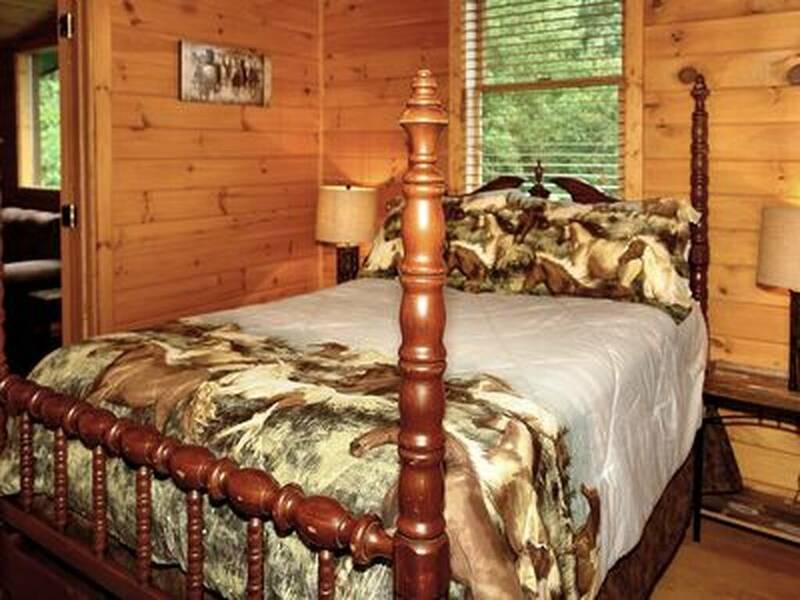 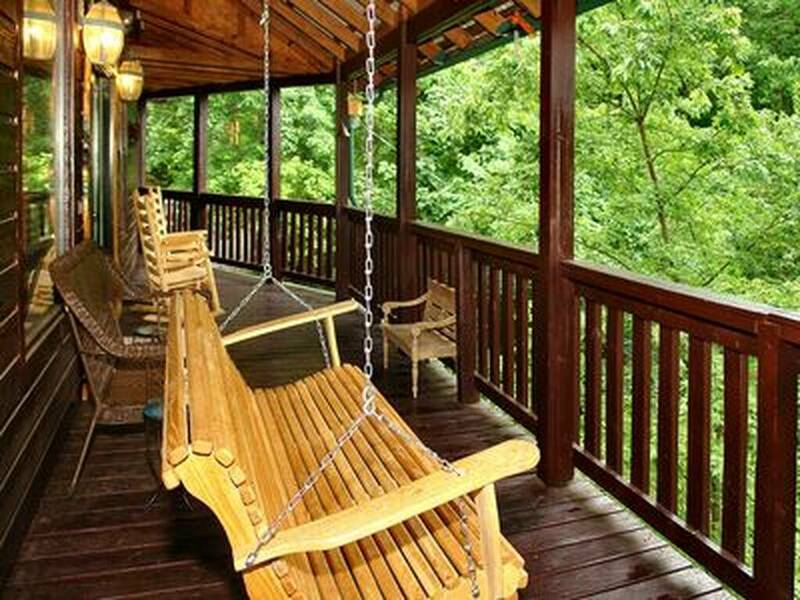 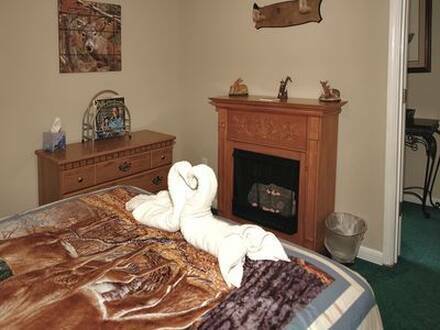 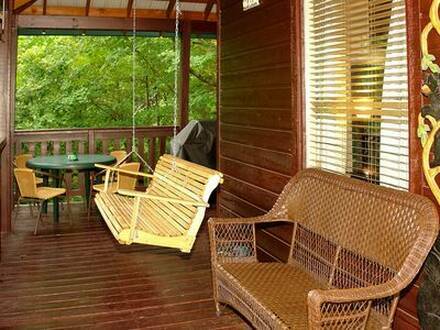 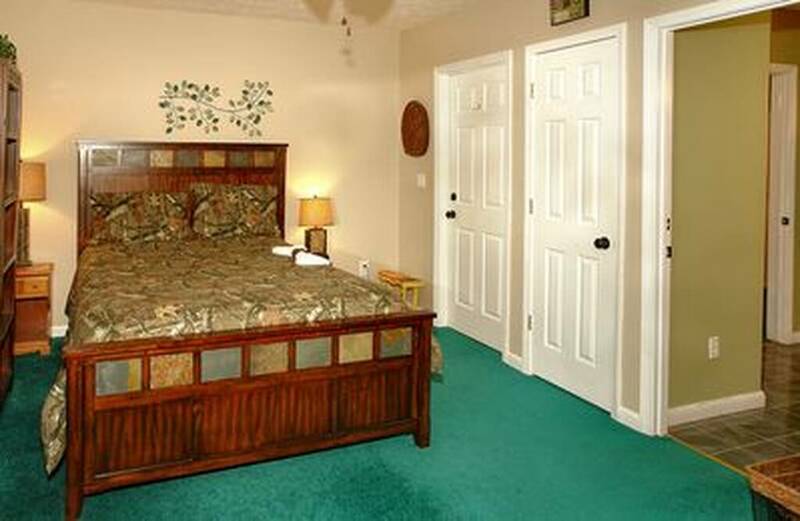 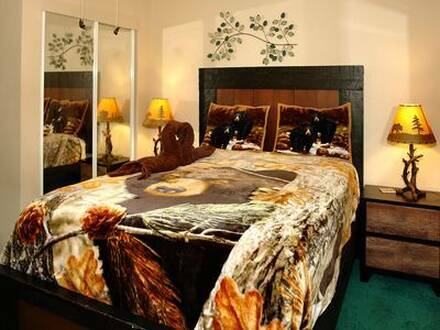 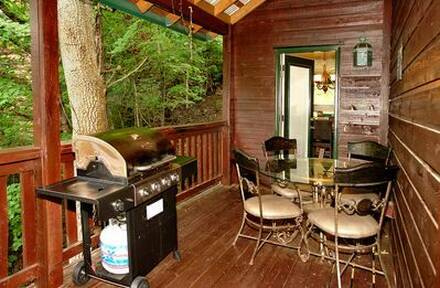 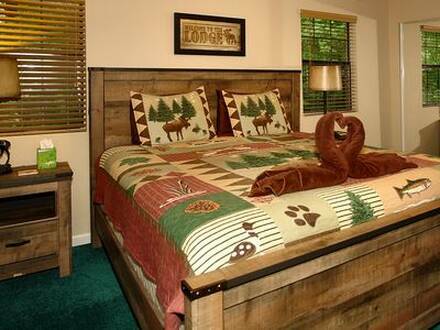 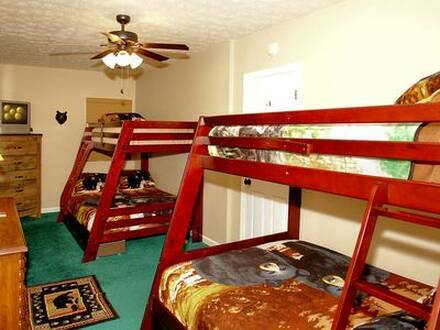 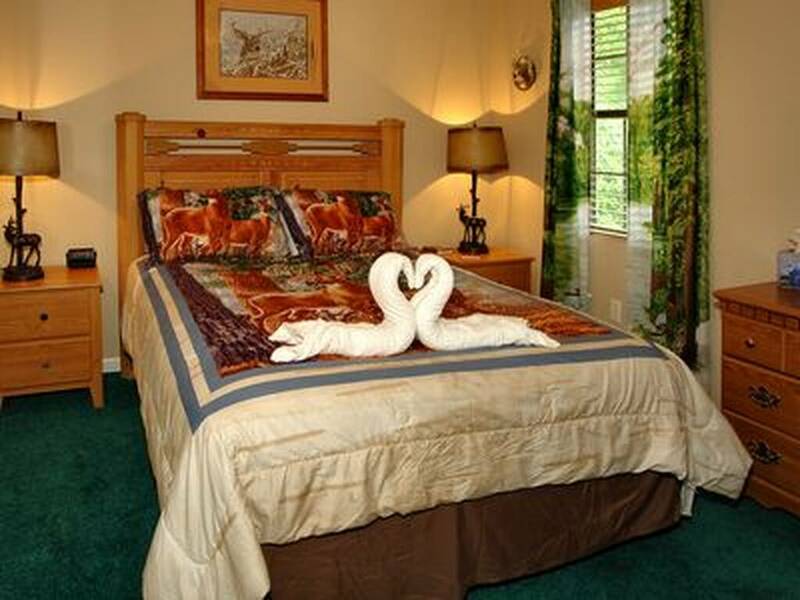 One of the biggest large cabins in Pigeon Forge, Tanner Mountain Lodge has space for up to 16 guests. 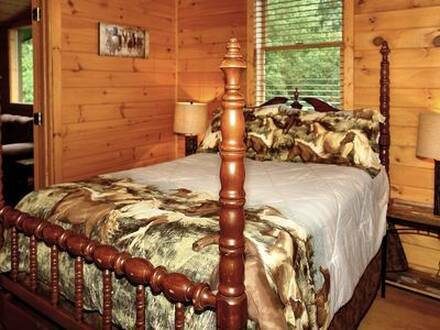 Plan your family reunion or group getaway and enjoy all the extra features that a large cabin offers. We treat everyone who stays to a free pancake breakfast at Reagan’s House of Pancakes, so start you day with a hearty meal and explore the amusement parks of Pigeon Forge or the more than 800 miles of trails in the Smokies. 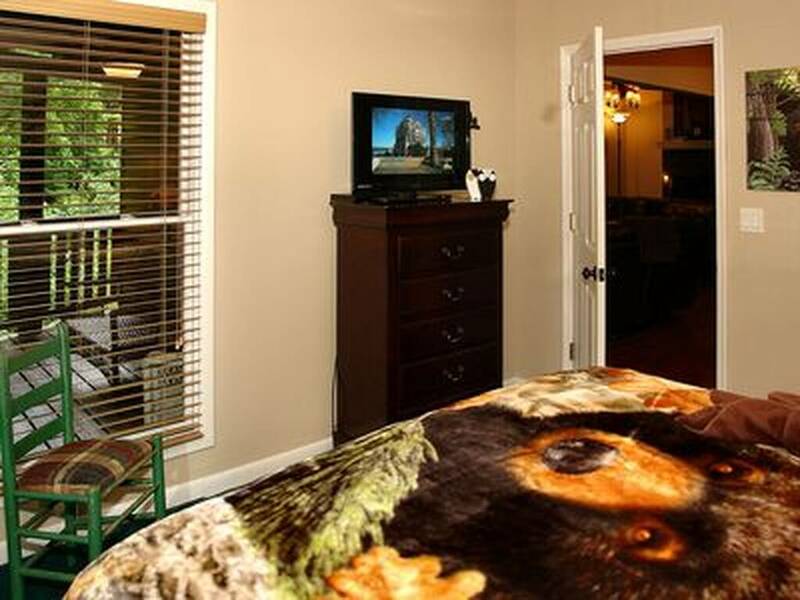 There are six bedrooms, all with a different theme, plus four bathrooms and a pair of sleeper sofas, so everyone can still enjoy their privacy. 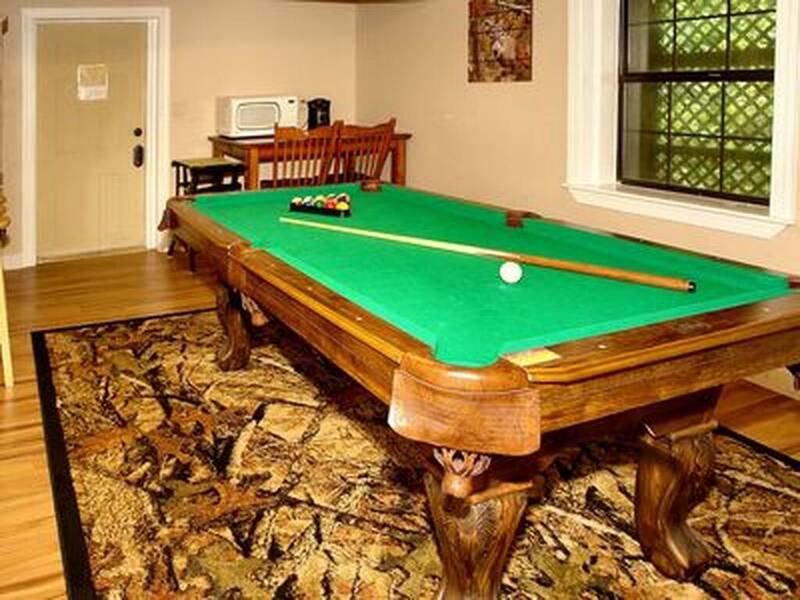 Congregate in one of several common rooms, including the basement ‘rec room’, with pool table, board games, and microwave for popcorn. 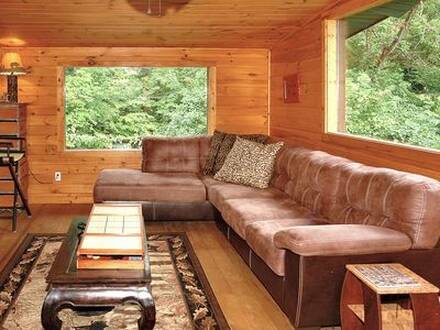 Upstairs has its own movie area with sectional couch and panoramic windows. 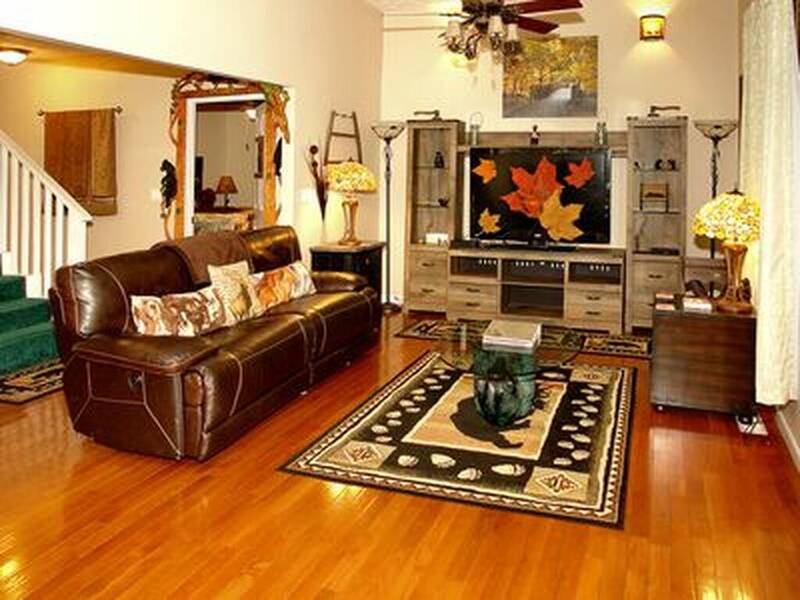 Use the large television with DVD player and plenty of movies from which to choose. 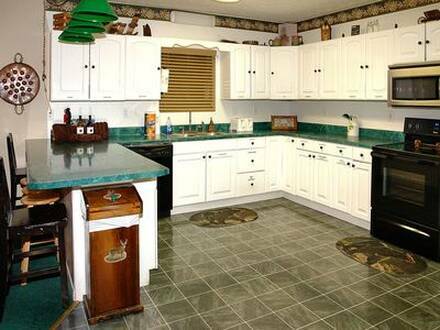 The main floor has a full kitchen, great for preparing snacks or a picnic and further lowering the cost per person of this spacious cabin. The cabin has cable television and free Wi-Fi as well. 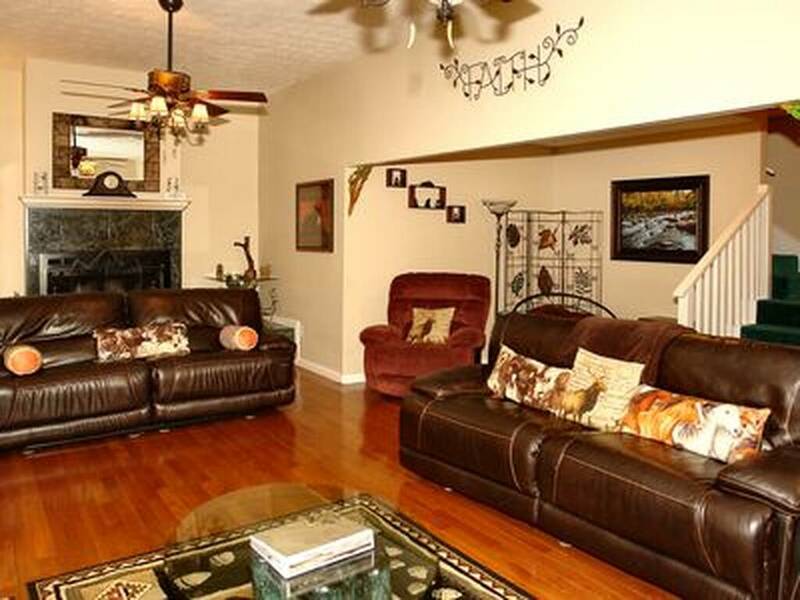 Enjoy the warmth of the living room fireplace as well! 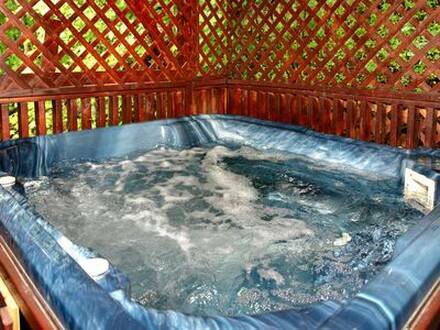 In addition to a jacuzzi inside, Tanner Mountain Lodge has a hot tub on the back balcony. 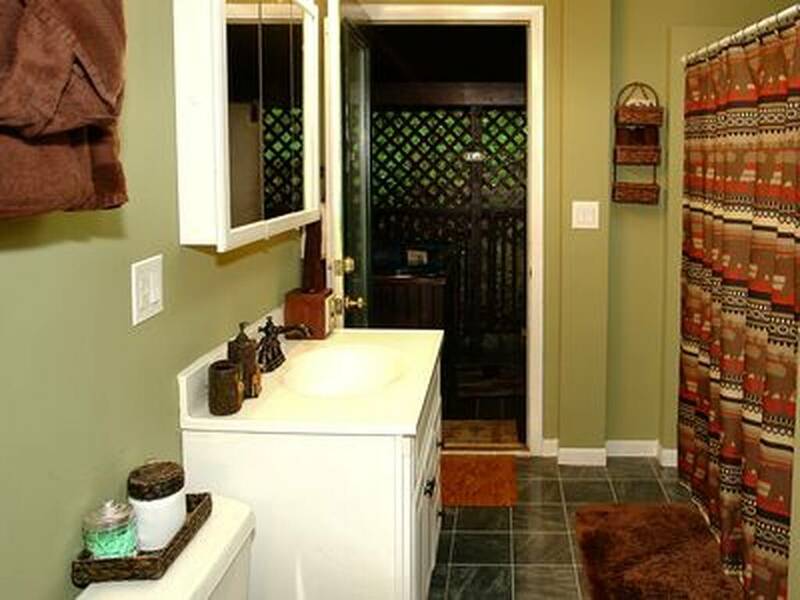 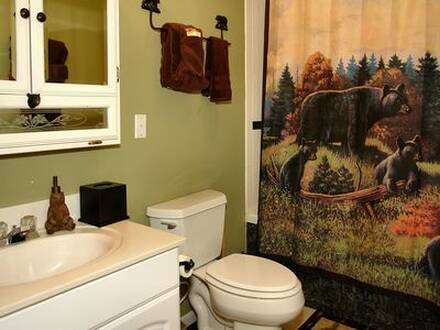 With a wraparound porch starting on the front, there are still spaces to have a romantic moment or quiet chat. 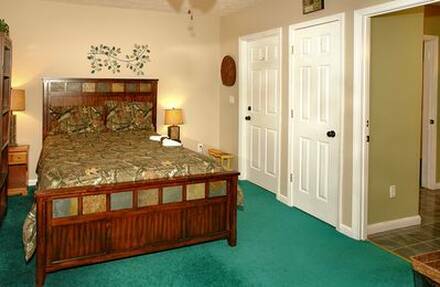 Check in and check out times differ for this rental: check in is 4 p.m. and check out is 11 a.m. Nightly minimums vary and no specials apply. 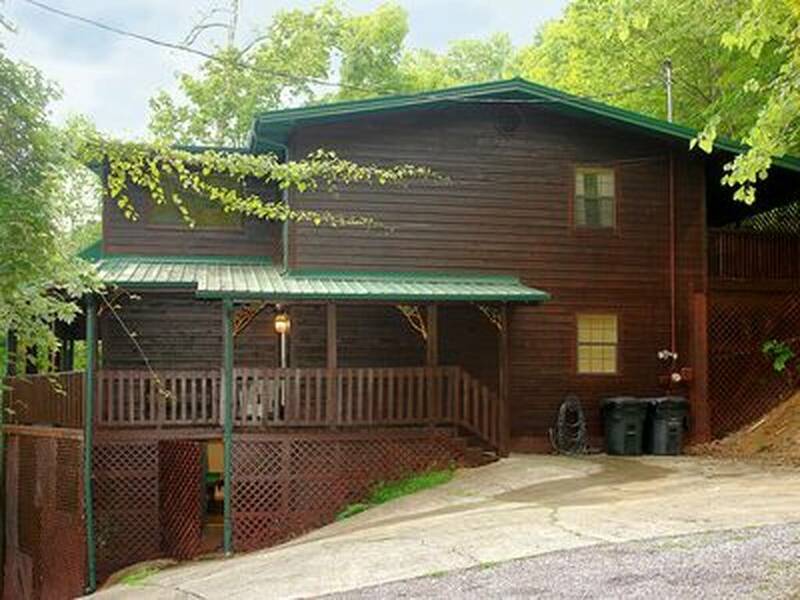 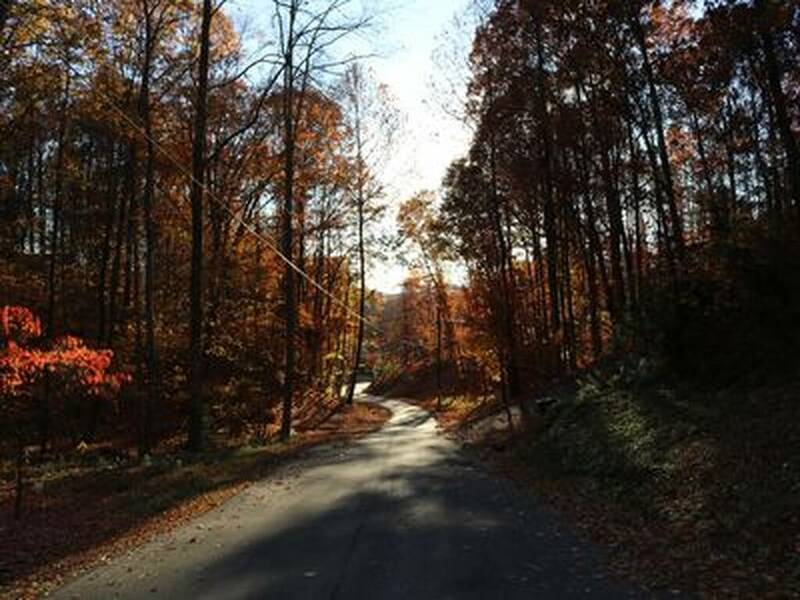 Book now, however, as there are very few large cabins in the Smokies that can sleep 16 and are only a few miles from the Parkway!